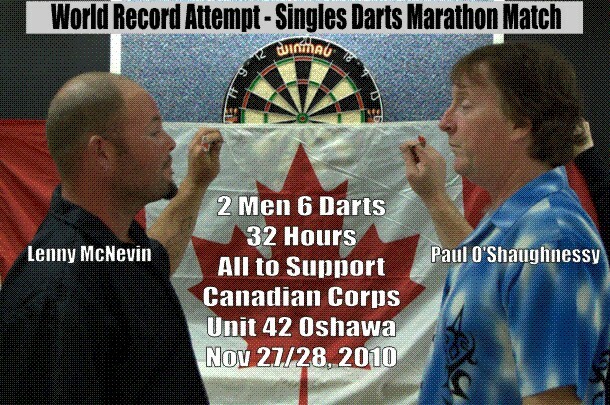 Can Two Canadians Claim the Darts World Record for Longest Match Ever Played? We brought the news to you earlier this summer that a new endurance record for playing darts was set in California at just over 30 hours. Now we’re pleased to tell you that a new World Record Attempt is happening north of the border, in Oshawa, Ontario. Long time dart players Lenny McNevin and Paul O’Shaughnessy are ready to make the attempt starting on Saturday November 27, and attempt to get their names in the record books for playing the longest continuous match of darts in history. They’ll start around 9:00 am Saturday and run continuously until sometime the next day, Sunday the 28th. The event is designed to raise money for the Canadian Corps Veterans Association Branch #42 in Oshawa, Ontario, which we were told has come into some financial trouble. The current record, which was recently recognized by Guinness, is 30 hours and 7 minutes. That means sometime around 3:08 on Sunday we’ll know if they were successful. We’ve been told that there is a lot of community buzz with the local Rogers cable television station in Durham putting an interview with them into heavy rotation, and a large crowd is expected the Sunday afternoon. Paul has been playing for nearly 30 years and Lenny for 7. We’ll keep our ears close to the ground and give you some updates as they get closer to the day.